Finally I got back to doing a little review. Well, the bar I’m presenting today may seem little, but not the review! Hilde Devolder slipped this mini bar from Original Beans in my last Purchase. She seems very curious about my reaction to this specific bar. The mini bar is part of a collection Original Beans sells, so you can try all their different origins in one go. Original Beans is one of the chocolate companies who invest the most in durable chocolate. Not only do they aim at setting up a durable and fair relationship with the growers, they also replenish instead of simply consume. This means for instance that the company did set up a program to plant new trees to support the rainforests where cacao grows. Not only does it protect the forest itself, it also creates a larger biodiversity. A prime example of the fact that making quality chocolate can mean social and biological prosperity aswell! Original Beans is a bit of a complicated company. Basically they are a team of people from several different countries who have combined the search for quality beans and setting up a good chocolate recipe and who produce the actual bars in Switzerland with the help of Felchlin. Now, back to the bar. This little bar comes in a bright pink wrapper, covered in golden ink. Very simple, yet effective. The bigger bars are hidden in a much more decorated sleeve, but we’ll keep those for an other occasion. After all, it is the taste that matters most! The bar itself is a nice rectangular piece, scored with fine lines. it is made of the illusive Porcelana bean grown in Peru. This cacao is renowned for its white color and delicate taste. 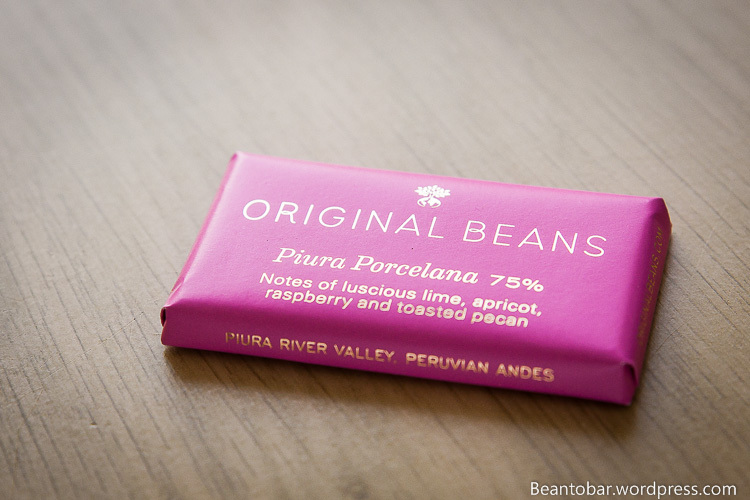 It is the second Porcelana chocolate I review (See Valrhona El Pedregal 2012), so I’m pretty excited to compare this one with my former experience. Color: an ebony wood-like, powerful looking dark brown. 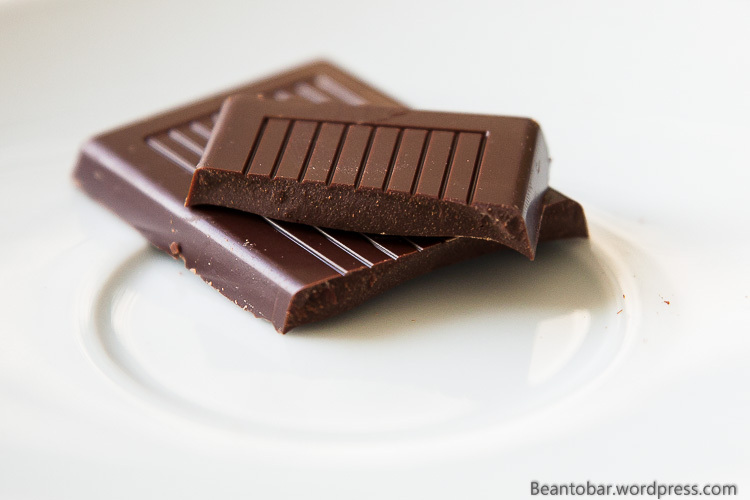 I’m always surprised that a white bean can produce such a dark chocolate when processed. Quiet a bit darker than Valrhona’s counterpart. Aroma: A distinct but delicate toasted aroma, nuts, sweetness and chocolate with a hint of dried fruits. Promising and different from all the chocolates I’ve sniffed so far. The bar clearly has a character of its own. Taste: A moderately quick and sweet start, bringing up front the roasted touch. Toasted bread and nuts come to mind. Almost reminding me of a dark Pralus roast, but less aggressive and very enjoyable. The first notes are quickly followed by gentle yellow fruits reminding me of apricot, dried raisin and… watermelon! With just that touch of espresso bitterness in the back. Melts rather quick and smooth with a good balance between sweetness and refreshing acidity. Almost like clenching your thirst on a very hot day. The chocolate actually disappears fast in your mouth and without a pause turns over to a balanced aftertaste which brings the toasted aromas back. The aftertaste has a nice length and is subtle yet very rewarding with a luscious chocolate aroma. The chocolate itself is not a powerhouse that will grab you by the collar, but rather seduces you with its balanced taste and surprising refreshing. It is light in nature, perfect as a morning chocolate that tingles on the palate and makes you crave for just a bit more. well deserved – 4 stars! Personally, I like this bar better than Valrhona’s version. It is higher in cacao content, but more important, it brings more taste variations. The Valrhona version provided a balanced yet single aroma style experience. 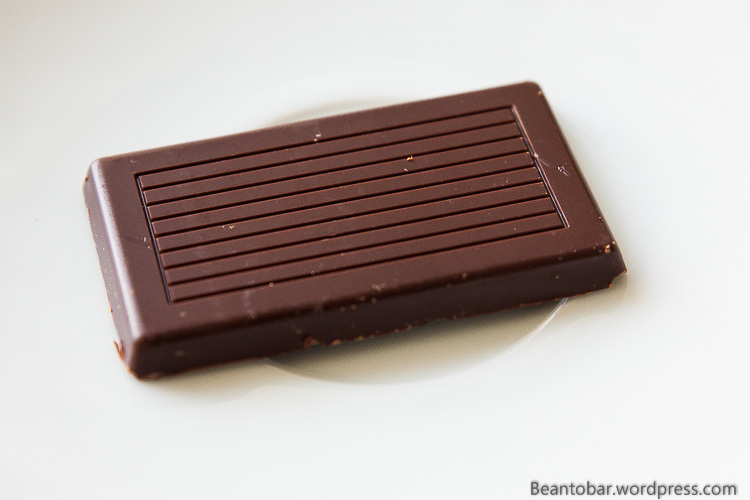 While this Original Beans bar once more shows the strength of a great quality chocolate. The numerous notes that can be detected and the evolution of the taste while you enjoy it.